Invoking a sense of calm with its charming style and pastel blue hue; the Natalie Outdoor Chair in Blue is a beautiful choice of relaxing chair to add to your exterior landscape! 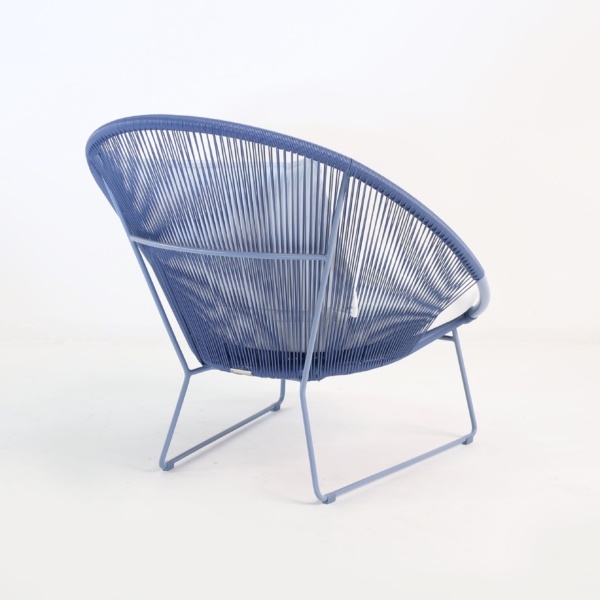 As though it has come out of the 60's and into your home, the Natalie Outdoor Lounge Chair in Blue has a fabulous low, rounded frame which sits on sturdy base, making you feel secure and safe in this generously proportioned piece. .
Add a touch of contemporary flair into your home with one of our Natalie Outdoor Lounge Chairs in Blue. The frame a elegant, rounded shape sitting on a sturdy feet. Measuring 34 by 36 inches and 32 inches high, this chair creates a nest with the beautiful, blue Ecolene® tubing wrapped around the frame and a soft Sunbrella® cushion on the base and back. Perfect for melting into for moments of relaxation within the luxury of your home. 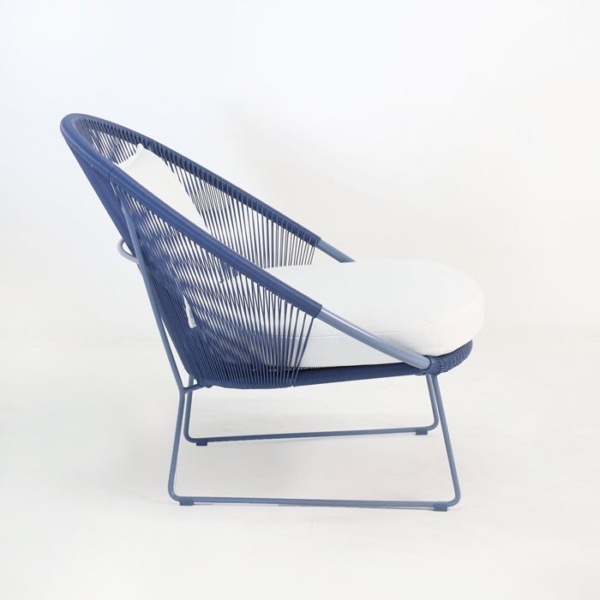 The Natalie Outdoor Lounge Chair in Blue is a fresh new piece of modern furniture from Teak Warehouse. 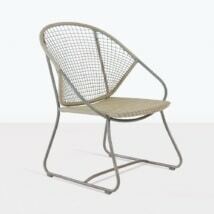 Made out of incredible Ecolene® an exciting addition to the world of polyethylene outdoor wicker fibers. Eco-friendly, you’ll be pleased to know this gorgeous chair has a green footprint, as well as being resistant to different temperatures, to avoid splitting and corrosion maintaining a beautiful feel and look. Teak Warehouse has everything for outdoors! We meld style with functionality and durability so that you will be happy with your choices in the bid from extending your living area to your outdoor area. 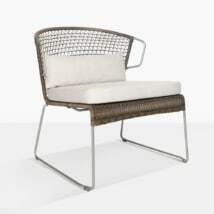 Alongside Ecolene®, our Outdoor All Weather Wickers include the Rehau® and award-winning Viro® range of furniture. Looking for more materials? We have glorious plantation A-Grade Teak, as well as Reclaimed Teak. New additions that have added more high-fashion options to our range include our Raw Concrete composites, Aluminium, #316 Stainless Steel, Batyline® and Textilene® mesh and Sunbrella® fabrics. Whether you have space for a delightful deep seating unit or long loungers, dashing dining sets, need shade from the hot sun, or whether you have plants in need of planters, then we encourage you to investigate our website, inquire online or call us now. In no time we will have your outdoor area a stylish and stunning space for you to enjoy with friends and family alike. Imagine 3 or 4 of the Natalie Outdoor Lounge Chair in Blue alongside your pool, a beautiful blend of blues, the ideal space for you to catch some rays, read a book and unwind. 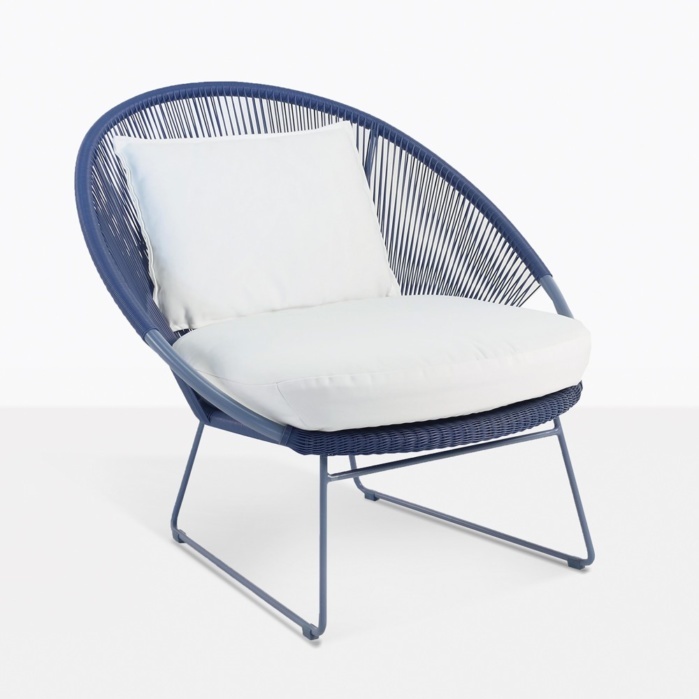 The Natalie Outdoor Lounge Chair in Blue is also suitable for indoors, add to your sitting room set for a mix of materials and a stylish, modern edge. Purchase 4 around a Raw Concrete low square Coffee Table for an interesting alternative to contemporary dining. 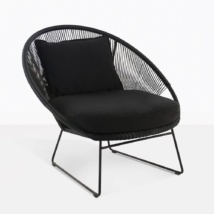 Relax and let your troubles melt away in this fun outdoor lounge chair. Add a pop of color to your outdoor space. 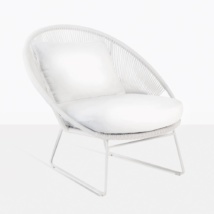 Whether you have a city balcony or poolside patio this will be the perfect chair. 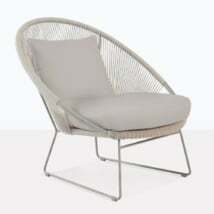 This outdoor lounge chair is also available in white, black or taupe. The Natalie Outdoor Lounge Chair in Blue will bring life to any space!